On Saturday, June 28, the Bermuda Zoological Society [BZS], along with lead sponsor Hiscox, hosted the second annual Reef Watch Citizen Science initiative, which supports the work of the Bermuda Reef Ecosystem Analysis and Monitoring [BREAM] programme, led by chief scientist Dr. Thaddeus Murdoch. A spokesperson said, “Throughout the day, volunteers carried out reef surveys, documenting coral health and counting different types of marine animals. Preliminary analysis of data provided by nearly 100 Reef Watchers suggests that Bermuda’s corals are healthy, although there is a concern about how few predatory fish, like grouper and snapper, were seen. Jeremy Pinchin, Hiscox CEO, said, “In working with BZS last year, Hiscox shared the vision of how we could inspire the citizens of Bermuda to get involved in the protection of Bermuda’s reef systems by collating scientific data and, at the same time, raising funding for the continued research required to ensure a healthy living reef system. “A daily – then hourly – e-mail campaign to all Reef Watchers let them know the success of their efforts until finally a winner was declared. Team Coral Coast, of Coral Coast Clothing, was the top team in raising $4,740. They were followed closely by Team Reef Rummer, which raised $4,203. “Prior to Reef Watch Day, participants were given training on how to survey reefs and identify what a healthy reef looks like. 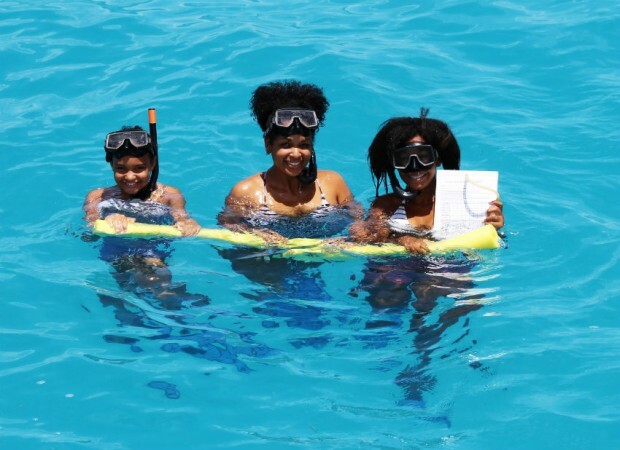 The Reef Watch handbook, handed out to participants, provided a detailed and colourful guide to the natural features of Bermuda’s coral reef habitats, how to find each boat’s geo-referenced survey reefs, and how to complete benthic surveys using a hula hoop. “Closing out the day’s events, BZS president Richard Winchell said, “The BZS is grateful to everyone who supported Reef Watch. Together, we are all making a difference. By simply observing what we see beneath the surface, and sharing what we see with researchers we all contribute to a better understanding of our shared marine environment”. Great Job — now all we have to do is eliminate the dreaded Lion Fish’.